Ensuring your server is protected 24/7 is of critical importance and a new Apache exploit that uses the server platform as part of a scam to acquire online bank details has reaffirmed the need for security. Dark Reading reports Eset has discovered an Apache attack that adds malware to web pages on a web server, which is able to hide its presence. The malware then convinces the Apache software into infecting a visitor’s PC with the software, which can then be used to steal banking logins and passwords. Security intelligence program manager for Eset Pierre-Marc Bureau explained the company was worried when it unearthed the vulnerability, which has the potential to be very widespread. “More than half of all web servers on the internet use Apache, so when we discovered a malicious Apache module in the wild last month, being used to inject malicious content into web pages displayed by compromised web servers, we were understandably concerned,” he remarked. He speculated that the team behind the attack is “probably a gang specialising in such attacks, then renting ‘traffic’ to other groups”. This is one of many exploits that could negatively affect a business, so having strong security in place is key. CIO.com recently advised small firms to make use of cPanel, a program that simplifies the backup process, so enterprises’ information will still be safe in the event of a database being attacked or failing. It also suggested using a virtual private network as an extra layer of protection if a firm is making use of sites that are known targets for hackers. When you’re looking for solutions for your website, chances are you’ll have a few options available when it comes to the servers you use as a platform. Although most people recognise the need for high-quality hosting services, they may find what is available confusing, with one of the main decisions being between shared hosting, virtual private servers (VPSs) or dedicated servers. While shared and virtual solutions may be adequate for smaller users and those with less demanding requirements, if you really want to take full control over your web server, a dedicated solution is the best way to go. In fact, technology news provider Sys-con.com highlighted three key reasons why you should choose a dedicated server over a VPS alternative. If you opt for a solution from SnelServer.com, you’ll be able to build your own dedicated server to your exact requirements. This means you can choose exactly how much memory and storage capacity you need, as well as the number and size of the processors. This gives you the freedom to ensure you get a solution that meets your unique power requirements, without you having to pay extra for capacity you don’t need. It also means you can scale up your system as and when you require without having to miss a beat. Unlike shared hosting services, the entirety of your dedicated server’s capacity and bandwidth is allocated to your own services, so you’ll never have to worry about high traffic from other users affecting your website. Similarly, not having to share services means you’re able to get the peace of mind that your data is secure and private, something that could be crucial in the current environment. As Sys-con.com’s article explained: “In a world full of frights and perils, Windows dedicated Servers and Linux dedicated servers provide the end user with security and lots of resources.” These are just three of the great reasons for opting for a dedicated server in order to give the control and security desired by businesses today, so why not see what SnelServer.com can offer your organisation. 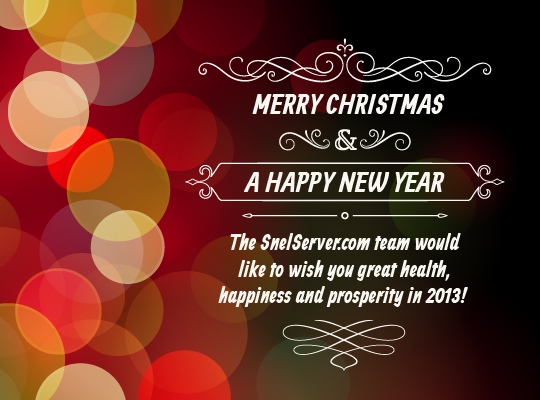 We would like to thank you most warmly for the confidence you have placed in us and the cooperation during 2012. As we close out the year, we wish all of you a Merry Christmas and a Happy New year! Why should you consider Windows Server 2012 Essentials? If you’re a small business looking to run your data center on dedicated servers, your choice of operating system is clearly going to be an important decision. Small businesses might not be able to justify investing in Windows Server 2012 Standard Edition, but happily, this isn’t the only option if you want to use Microsoft technology as the basis for your data center. If you’ve got fewer than 25 users of your network, you should look at Windows Server 2012 Essentials. While you don’t get access to features such as Microsoft Hyper-V with this, information website ServerWatch said you should find it does offer all the vital tools to get your firm up and running. For example, it does offer a number of new capabilities that weren’t present in previous editions of Small Business Server, such as the ability to hook up to Microsoft’s cloud services, like Azure and Office 365. This could be important for many businesses in the coming years, as news publication Windows IT Pro stated Microsoft’s vision for the future is a ‘cloud OS’ environment where much of a network’s operations are hosted remotely. ServerWatch also noted one of the great things about Windows Server 2012 Essentials is that it comes with an easy to use Dashboard interface that lets an administrator take complete control of all crucial management functions. This offers an intuitive graphical user interface with point and click controls that can help users find information, view warning messages and perform some of the most commonly-used actions. The publication concluded that although the product is more limited than the Standard edition, the access it provides to Microsoft’s cloud offerings makes for a solid product that’s capable of meeting the basic server needs of any small business.